In the dawn of aviation, Frenchman Jacques Schneider, son of a rich armament manufacturer, subscribed to the idea that aircraft would become an important method of transporting goods and people. He envisioned cargo and passenger air­craft transporting people and goods over great distances, and across oceans. Because of the lack of reliability, if aircraft were to fly over water and had a problem, as seaplanes they could safety land at sea. 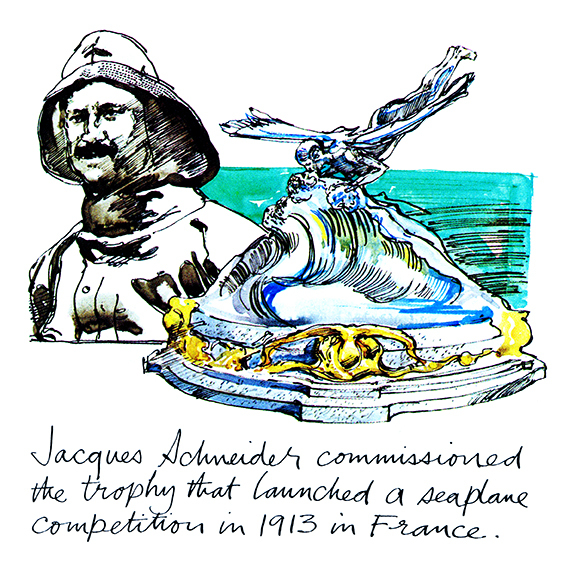 To encourage the development of seaplanes towards that end, he posted 50,000 francs as incentive and created the “La Coupe d’ Aviation Maritime Jacques Schneider” and provided the famous Schneider Trophy. During the next 18 years, 13 events were scheduled, the 1919 race in England was declared void (no one correctly completed the race) and one race was called off (only the U. S. was ready) in 1924 in America. The British, Americans and Ital­ians were multiple winners, with France, where it all began only posting that first victory. Germany and Switzerland both made attempts but with no real success. In 1931 the final Schneider Trophy Race was held in England with the British posting their third consecutive win and thus retiring the Trophy. The British ran uncontested, refusing postponement requests by France and Italy, and in that final day set a World Speed Record of 406 mph! The Schneider races had been the catalyst to improve engines and airframes and advance the knowledge of flight and speed from 60 to over 400 mph in 18 short years. Yes, these were great thrilling races, but the allies in World War II owe much of their success to the Schneider Races for developing the engines and airframes designs from which sprung their greatest aircraft. The Allison V-12 engines that powered the famous P-51 Mustangs and P-38 Lightnings of the U.S. In England, the Rolls Royce Merlins and Gryphon engines powered many great British aircraft including the Supermarine Spitfire, a direct descendent of the Supermarine Schneider racers. One final note: Although the British retired the Trophy and ended the official series, the Italian Macchi factory was perfecting a new super racer. Denied their request for a postponement of the race, the Macchi factory continued to develop the ultimate Schneider Racer, the MC-72. Mario Castolli, the chief designer at Macchi, worked undaunted and in 1933, they broke all world speed records only to come back in 1934 and break their own world absolute speed record at 440 mph. This record remains unbroken to this day for propeller driven seaplanes.